The year 2002 was a memorable one. The Euro was introduced as real money. Brazil won the Football World Cup for the fifth time. Red Hot Chili Peppers launched their new album “By The Way”. And Volkswagen presented the most powerful Golf of all time: the R32. About ten years ago, you could read in the local news that the new R32 should be more than a match for the Astra OPC (VXR), the Alfa Romeo 147 GTA, and the Ford Focus RS. The English-speaking motoring press was even more enthusiastic: Car and Driver considered it as a competitor for the Subaru Impreza WRX STi and the Mitsubishi Lancer Evo 8, The Truth About Cars even went as far as to compare it to the Porsche Carrera 4. Even though the Golf IV was at the end of its model cycle, in 2002 it still smashed some records. In the previous year, it had been the bestselling automobile in Europe once again, and in June the Golf overtook the Beetle – which was the worldwide number one until then – counting the units sold in total. The world's hunger for the Golf seemed to be insatiable and Volkswagen was enjoying its position - they had been working for decades to get there. In order to fulfil the wishes of all the customers, they packed every engine they had at the time under the flat bonnet. I wouldn't be surprised if the story of the R32 was similar to the story of the BMW 2002. According to some dubious hearsay, in 1967, one year after the launch of the very popular 1600-2, Alex von Falkenhausen, the engine constructor and Helmut Werner Bönsch, the leading engineer ran into each other in the factory car park. Both of them were driving 1600-2s and they discovered that both of them had secretly replaced the engine of the small two-door with the 2-litre, 100 PS unit of the BMW 2000 four-door sedan. It didn't take too much time after this prank had come to light during the spontaneous showing-off, for the two engineers to bring up the idea at the management board. Unfortunately, the gentleman there didn't share the engineers' opinion that the big engine is a perfect match for the small car, but the director, Paul G. Hahnemann loved the concept. If not for him, the legendary 2002 probably wouldn't have been born. 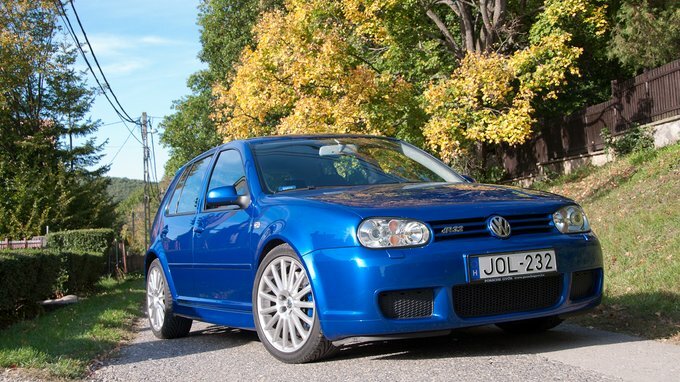 Maybe the Golf R32's history could be traced back to an ingenious engineer and a weekend shed, too. The main parts were all available on the factory shelf. 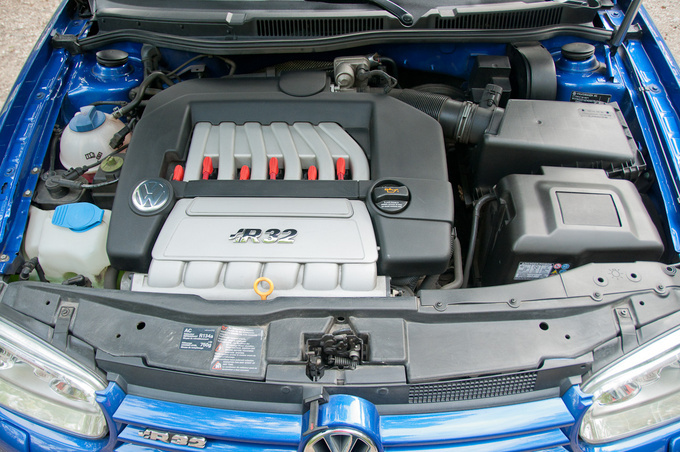 The VR6 engine, enlarged to 3,2 litres, was on the test bench in order to squeeze out the last horsepower for the Audi TT. 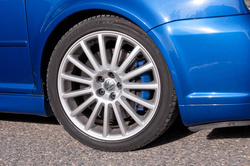 The Syncro drivetrain with the Haldex clutch was already a well established system under the Golf IV's platform, and the brakes of the Passat W8 were also a bolt-on mod. But who'd have thought that it would be such a blast when you pick the right parts? Even Volkswagen didn't have much faith in the model. 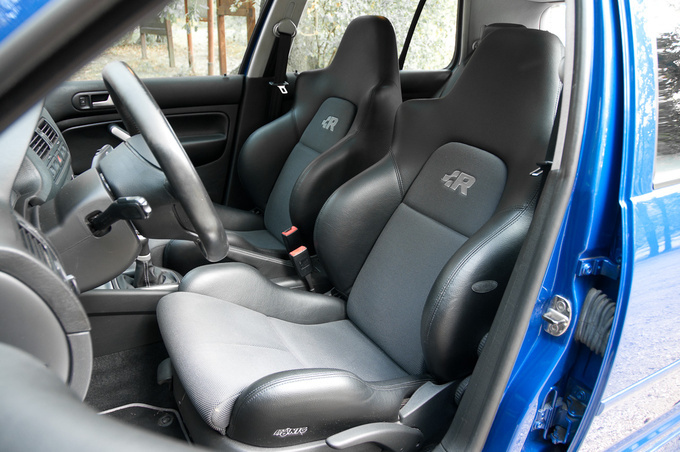 They somehow felt that they shouldn't leave the Focus RS alone, and that the GTI seemed lukewarm in the hotted up league of über-hatches, but they must have been shocked after they had seen the bottom-line of the costs of the R32's components. Nevertheless they gave it a chance in a small run, with a bold price-tag: it cost more than twice a standard Golf. But the folks made a rush for it. In the US, the 5000 units, which VW considered suffice for two years, were gone after 13 months. In 2002 the author of this article was chiselling a Peugeot 205 GTI, prepping it for track use as part of his motorsports studies. That car seemed to be a realistic goal for a future project, even from an Eastern European point of view. Not the R32. That one was absolutely out of reach. Máté, the owner of this blue R32 had similar thoughts. In 2008 when he was looking for a replacement for his Corsa, he didn't mean it for real when he typed the keyword into the search engine. But what he found was a once-in-a-lifetime chance. He bought the car without thinking twice, and didn't regret it for a moment. I can understand, why. Today the Golf is eight years old, but our small crowd was looking at it with such adoration as it was a fifty year old Maserati. When Máté brought the car to our office, the whole editorial staff came down to the car park - you don't see too many R32s on the streets, and virtually none of the Golf IV R32s. We're chit-chatting with the owner when he suddenly drops the number 8000, followed by a deep silence. Please, confirm what we've just heard. No mistake, he bought the R32 with a mere 8000 kilometres on the clock when it was four years old. Now, after four more years, the odometer shows 32000. At first we're a bit suspicious, but after checking all the details we have to give up. The R32 is virtually new. 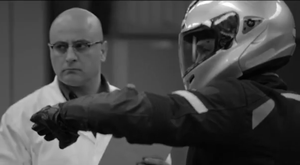 As we open the bonnet, we instantly feel the engine's heat. It'd certainly prefer a cooler spot in the summer, but apparently the drive train is reliable. Máté obviously didn't have any serious problems with the mint-condition Golf so far, he only had a leaking differential once, but the reason for this was simply too much oil in the case. Oh yes, and a rubber part, holding the exhaust system, gave up once, but that's really all that happened over the four years. But the R32-community doesn't discuss too much about troubleshooting, rather, they talk about modifying and tuning. Turbo and blower kits are hot topics, the drivetrain is apparently capable of more than the stock engine's power. After carefully navigating my way out of the car park, I could hand back the keys to the owner. Thank you, that much is enough. I don't have to change into second gear, I really don't have to try at what speeds it'll understeer. From the very first moment I can feel that this is a truly serious car. If you've ever tried a Golf IV, forget it. That's something else. 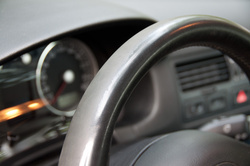 The steering wheel is almost too thick, and not only its bottom, but also the two sides are flat. It's not thick by mistake though, you have to apply some real force to turn it round. The quick ratio steering rack came together with the whole suspension of the Audi TT. It's the same platform, no big deal, really. The multilink rear suspension will only show its talents later, but hitting the first pebble on the asphalt tells me how incredibly firm the set-up is. I don't see how the VW bosses could approve this. In many articles this is characterized as track day friendly suspension, and no doubt, this one is really closer to race-car spring rates than you'd expect from any road car. At low speeds you'd suspect that wooden blocks are installed instead of springs - you'll feel the cracks in the asphalt which are otherwise invisible to the naked eye. The bulky knob of the gearstick moves tightly, no sign of the synthetic feel of the standard Golf, and on the accelerator only a few millimetres decide about idling or having your head thrown back. And we haven't spoken about the sound yet. The VR6 was renamed to V6 because of its bad reputation, but the engine noise tells tales about the narrow angle of the V. Up to 2500 rpm you'll hear heavy bombers in high altitude, then a flap opens in the exhaust and all of a sudden you find yourself sitting on a contemporary superbike with a barely street legal silencer. You really don't need to go flat out – its scent, its feel, every motion of the R32 gives away the fact that it's a real sports car. Sitting in the bucket seats, bumping along the roads leading out of the city, I listen to the story of the blue Golf while getting to know the car. The previous owner who had bought it as new, reportedly kept the R32 in the showroom of his own factory, like a sculpture. The best employees could get it as a bonus for the weekend. Then the credit crunch came along. The dealer advertised the Golf with 8000 kilometres on the clock (I still can't believe it) for six long months, although it wasn't too expensive compared to the prices at the healthier German market. This is the car that really deserved the tag “rarity” in the ads, right from the beginning. The R32 was never cheap enough to be toasted by boy-racers, and now, being a mere eight years old, it's almost a classic. Roughly 15 thousand were produced, and no matter how special they are among the Golfs, even those get killed. Well, a corner taken too fast on the Nürburgring is a more glorious death than a traffic accident, but in both cases we have to cross off the Golf IV R32 from the list. Since Máté has had it, this Golf has never had to sleep outdoors. The owner is concerned about issues like the exhaust end pipes which can't be freed of the deposits inside. He's really upset about the poor quality leather on the steering wheel which has lost its nice touch. It urgently needs replacing. Yeah, I was about to say that's a scandal. As we eventually leave the city, the tachometer prances, and the suspension smoothens out as if it had reached its working temperature. The bouncing is not disturbing any more since I'm enjoying how this amazing car blazes around the corners. The heavily cracked patchwork on the road doesn't upset it at all, there is no uncertainty in the flat ride, and most surprisingly it doesn't feel too heavy at the front. Before I could find out if the front or the rear would let go earlier, I remember that I shouldn't drive this car so hard, because its place is in a museum. There is a smell of Audi in the air, a nearly perfect balance that shouldn't be disturbed on public roads. Of course, it's the suspension of the TT. I have no doubt the R32 belongs to the racetrack. Máté however doesn't take it to trackdays, no matter how much he would love to do so. It'd be impossible to preserve this untouched condition. That's the price you have to pay if you want to own such a rare car - and Máté knows how to protect his Golf. I'm testing the responses of the hidden-in-a-Golf Audi and the ones of the owner as well, but both of them seem to be unmoved by the potholes, the gearshifts just before the red line or by the hard braking into corners. I have the impression that the R32 would infinitely endure this kind of abuse. Then a strange idea comes into my mind. No wonder I consider the R32 as a classic, since the days of these kinds of cars are most probably over. Of course there will be a GTI version of every future Golf, and probably an R version, too, but they certainly won't use such a beast of a naturally aspirated engine any more. The future belongs to the turbo – at least it seems so at the moment. The motoring press agrees that the next generation of the R32 became much softer, so we should appreciate the siblings of this blue one. Luckily there are a few who care about their R32's. When I give back the keys I'm still emotional that I had the opportunity to drive this car. The rational part of my brain knows that this is just an Audi TT 3.2 with a slightly larger cabin, but the impression you get is different. It's always a bigger thrill if you have this kind of brutality in a car which looks like an everyday ride. But the R32 is so different from a GTI that from the inside you wouldn't believe it's a Golf. And in the meantime the passers-by are convinced that you're driving some pimped VW. I wouldn't mind - the few who know will appreciate it.